In addition to the quality HVAC services that we provide, our plumbing experts can help you with all of your plumbing needs. Maintaining your pipes can be just as important as making sure that all of your indoor air quality needs are met, and by working with our company, you are guaranteed to get the highest quality service that you deserve. 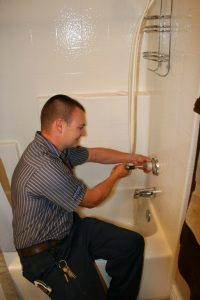 We provide a wide variety of plumbing services, each of which is custom tailored to help you with your unique situation. One of the most prominent services that our company offers is the repair and installation of fixtures. Whether your current fixture needs to be repaired or you would like a new fixture installed, our professionals will be ready to work with you. All of these services are competitively priced to work with your needs, helping you save money by minimizing leaks. Our leak detection specialists use state of the art equipment to help you save money on potentially damaging leaks. Professional hydro-jetting technology makes use of water pressure to help clear any drain blockage while, at the same time, cleaning the insides of the pipes themselves. Hydro-jetters work quickly and efficiently and can help leave your pipes in near new condition. Combining hydro-jetting with video inspection and you will be able to completely refurbish the inside of your pipes without worrying about expensive repiping procedures. Additionally, we have video inspection professionals who can help you determine the exact cause of your slow draining pipe problems. Often, the causes for these conditions occur deep within the pipe itself, and if it is not diagnosed immediately, major problems can arise. Through the use of video inspection technology, you can determine the exact cause of the problem, no matter whether it is a root intrusion or a crushed or cracked pipe. Video camera inspections are among the safest and most minimally invasive ways to analyze troublesome pipes and figure out the problem. Our factory authorized installation experts can help provide your home with special water heaters that do not utilize a tank to help you cut down on wasted energy and regular maintenance costs. These tankless water heaters require no pilot light to heat water, and all are able to function immediately, providing you with the exact level of comfort that you need. Additionally, these heaters last much longer than ones that utilize a tank, and you will be able to rely on their services for upwards of twenty years.